Aim : To determine the effect of fiber and its orientation on the fracture resistance of composite restorations in root-filled premolars. Materials and Methods : 50 sound human premolars were collected and assigned to five groups of ten specimens each. In group 1 (control), specimens were not root-filled. In the other four groups, MOD cavities were prepared and the cusps were reduced to 1.5 mm. In groups 2 and 3, the samples were filled with Z-250 and spectrum composites respectively without fiber reinforcement. Groups 4 and 5 were reinforced with Fiber-Ribbon-(Angelus) and restored with spectrum composite. Fibers were placed in the U-shaped design in group 4 while they were placed in the cross-shape in occlusal region in group 5. The fracture resistance was tested using a mechanical testing machine at crosshead speed of 1mm/min. Results : The fracture strength of control group was 1271.16±722.04 N while it was 952.05±330.16 N for group 2, 918.52±256.6 N for group 3, 857.13±184.58 N for group 4 and 1138.81±406.64 N for group 5. Fracture strength of group 5 was more than other groups except for group 1, there was no statistically significant differences. Conclusions : The reinforcement of composite with fiber does not increase fracture resistance of root-filled premolars significantly. The aim of this study was to determine the effect of fiber orientation on fracture strength of root-canal treated and restored teeth. In this experimental-lab investigation, 50 intact human maxillary premolar teeth that had been extracted due to periodontal disease or orthodontic treatments were chosen, samples were evaluated for any cracks or carries on crown and root surface utilizing a stereomicroscope at 25 times magnification. Samples were assigned into five groups of ten each. Group 1: No preparation or restoration. Group 2: After cavity preparation, teeth were etched with 37% phosphoric acid for 20 s, washed for 10 s, air dried, then Single Bond (3M ESPE ,USA)bonding agent was applied to the etched surfaces. Following a 10 s delay, excess bonding was removed with medium power air syringe and then cured using the light-cure apparatus (VSI, ARIALUX, ARIADENT) for 10 s.
Then composite restorative material was applied by layering technique in the cavity. The thickness of each layer was less than 2mm and curing time for Z-250 (3M ESPE , USA) was according to company's instructions. For forming the occlusal surface, a proper amount of composite was put on the tooth surface and teeth were put in pre-prepared moulds, after removing the excess composite, the last layer was also cured. Group 3: All stages were repeated like the aforementioned group except that instead of Z250 composite, spectrum composite (Cauk-Dentsply, Milfmd, USA) was used. Group 4: Cavity preparation, etching, irrigation and bonding stages were done like group 2, for restoring the tooth, primarily composite with less than 2mm thickness was placed at the bottom of pulp chamber and cured, then a thin layer of flowable composite (Cauk-Dentsply, Milfmd,USA) was applied and fibers (Angelus, Rua-Goias, Brazil)were placed in a U-shaped pattern at the bottom of pulp chamber embedded in flow composite with 1 mm distance from the occlusal level and both were cured for 20 s, then additional composite layers were added to complete the restoration as it was done for group 2. Group 5: All stages were done like group 4 except for fiber position and orientation. In this group fibers were orientated in a cross shape pattern in occlusal area. Fibers were orientated mesiodistally on the surface of uncured composite, adjusted and cured together, then a little bit of flowable composite was applied on it and fibers were positioned buccopallataly and cured after adjustment. Then, restoration was completed in such a way that approximately 1mm of composite would be present around the fiber. After restoration of teeth, they were placed in distilled water and kept in incubator for 7 days; then samples were subjected to compressive force using the mechanical testing machine (ULM,Zwick gamj & Co. kg Germany) at cross head speed of 1mm/min perpendicular to occlusal plane of teeth. Force loading phases were recorded in a stress (N)/strain (μm) graph utilizing Test Xpert software in the mechanical testing machine. Maximal amount of forces applied until tooth failures were determined. For evaluation of the failure pattern, all specimens were analyzed visually and assigned to four groups based on the fracture position in relation with CEJ. The four groups were as follows: up to the CEJ, below CEJ, on the restoration and on the tooth. The percentiles of each kind of fracture were determined for each group. The data were analyzed by one-way ANOVA analysis under the significant level of α ≤ 0.05. 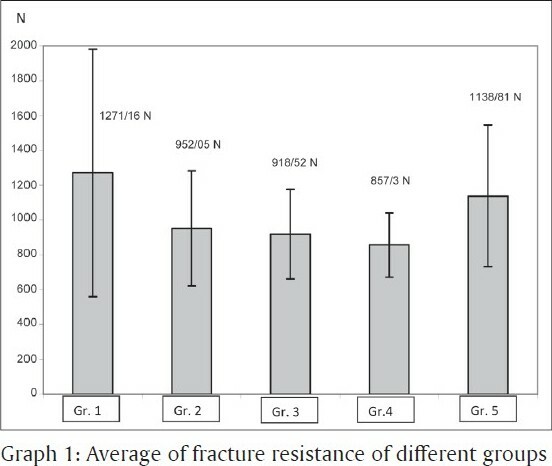 The results of fracture strength of different groups are shown in Graph 1. Data assessed with unilateral variance analysis and our results showed that use of fiber can increase fracture resistance of tooth but no significant differences were detected between groups. (P = 0.21) In other words, using or not using fibers did not show any significant differences in increasing fracture strength of specimens but had an important effect in the fracture pattern. In evaluation of the fracture type, most of fractures above the CEJ occurred in group 5 and the least occurred in group 4. In evaluation of fracture's occurrence on restoration or tooth, most of fractures on restorations occurred in group 5 and the least occurred in group 3. Fiber-reinforced composite (FRC) restoration has been considered as a new alternative for posterior composite restoration. In this study, we investigate the effect of fiber-orientation and composite type in four groups of cases using two kinds of orientation of fibers plus two composite types and compared them to a control group. Our data showed that reinforcement of composite with fiber does not increase fracture resistance of root-filled premolars significantly. This study showed that there is no significant difference in fracture strength of teeth restored with spectrum and Z-250 composites. Spectrum composite contains 86% volume percent of filler particles with 0.01-1.5 μm. Z-250 composite contains zirconium and silica filler with 60% volume percent and the average particle size is 0.6 μm. Modulus of elasticity of Z-250 composite is equal to 11 and in spectrum composite is 10.572. Similarity of mechanical properties may be responsible for similar fracture strength of these two composites. During restoration of teeth with composite restorative materials different factors such as cavity dimension and restorative system may influence resistance of teeth against fracture. Considering these issues, in this study we tried to eliminate all interfering variables and assimilated all groups. Further research is needed to evaluate the effect of ageing in water or saliva on fiber reinforcement. The results of this study showed that use of fibers, fiber orientation and type of composite have no significant difference in fracture resistance of the restored, root canal- treated maxillary premolars. However, the fiber positioning in a buccopalatal and mesiodistal orientation in the occlusal area showed higher fracture resistance; moreover, fiber utilization could change fracture type in restored maxillary premolars and switched it to more restorable fractures. 1. Medige J, Deng Y, Yu X. Effect of restoration materials on cuspal flexure. Quintessence Int 1995;26:571-6. 2. Meshram GK, Dong N, Mittal RK. Effects of designs of class II preparations on resistance of teeth to fracture. Indian J Dent 1997;8:90-4. 3. Malament S, Socransky S. Survival of Dicor glass-ceramic dental restorations over 14 years, Part 2: Effect of thickness of Dicor material and design of tooth preparations. J Prosthet Dent 1999;81:662-7. 4. Art and science of restorative dentistry, Sturdevant, 2002. Chap. 11, p. 517. 5. Flavia A, Borges S, Correr GM, Alexandve M, Sinhoreti C. Compressive strength recovery by composite onlays in primary teeth substrate treatment and luting agent effect. J Dent 2006;34:478-84. 6. Nandini S. Indirect resin composites. J Conserv Dent 2010;13:184-94. 7. Turkaslan S, Tezvergil-Mutluay A, Bagis B, Pekka K. Effect of fiber-reinforced composites on the failure load and failure mode of composite veneers. Dent Mater 2009;28:530-6. 8. David N, Vistasp M, Karbhar ME. Physical behaviors of fiber reinforcement as applied to tooth stabilization. Dent Clin North Am 1999;43:7-35. 9. Dyer SR, Lassila LV, Jokinen M, Vallittu PK. Effect of cross-sectional design on the modulus of elasticity and toughness of fibre-reinforced composite materials. J Prosthet Dent 2005;94:219-26. 10. Kanie T, Fuji K, Arikawa H. Flexural properties and impact strength of denture base polymer reinforced with woven glass fibres. Dent Mater 2000;16:150-8. 11. Garoushi S, Lassila LV, Tezvergil A, Vallittu PK. Static and fatigue compression test for particulate filler composite resin with fiber-reinforced composite substructure. Dent Mater 2007;23:17-23. 12. Belli S, Erdemir A, Ozcopur M, Eskitascioglu G. The effect of fiber insertion on fracture resistance of root filled molar teeth with MOD preparation restored with composite. Int Endod J 2005;38:73-80. 13. DeBoer J, Vermilyea SG, Brady RE. The effect of carbon fiber orientation on the fatigue resistance and bending properties of two denture resins. J Prosthet Dent 1984;51:119-21. 14. Fennis WM, Tezvergil A, Kuijis RH, Lassila LV, Kreulen CM, Creugers NH. In vitro fracture resistance of fiber reinforced cusp-replacing composite restorations. Dent Mater 2005;21:565-72. 15. Akman S, Akman M, Eskitascioglu G. Influence of several fibre-reinforced composite restoration techniques on cusp movement and fracture strength of molar teeth. Int Endod J 2011;44:407-15. 16. Carlos J. Fracture strength of composite fixed partial denture using bovine teeth as a substitute for human teeth with or without fiber-reinforcement. Braz Dent J.2010;21:235-40. 17. Fennis M, Kuijis H, Krevelen M, Roeters F. A survey of cusp fractures in a population of general dental practices. Int J Prosthodont 2002;15:559- 63. 18. Rudo DN, Karbhari VM. Physical behaviors of fiber reinforcement as applied to tooth stabilization. Dent Clin North Am 1999;43:7-35. 19. Eakle WS. Fracture resistance of teeth restored with Class II bonded composite resin. J Dent Res 1986;65:149-53. 20. Samadzadeh A, Kugel G Hurley E, Aboushala A. Fracture strength of provisional restorations reinforced with plasma treated woven polyethylene fiber. J Prosthet Dent 1997;78:447-50. 21. Fennis WM, Tezvergil A, Kuijs RH, Lassila LV, Kreulen CM, Creugers NH, et al. In vitro fracture resistance of fiber reinforced cusp-replacing composite restorations. Dent Mater 2005;21:565-72. 22. Belli S, Erdemir A, Yildirim C. Reinforcement effect of polyethylene fibre in root-filled teeth: Comparison of two restoration techniques. Int Endod J 2006;39:136-42. 23. Dyer SR, Lassila LV, Jokinen M, Vallittu PK. Effect of fiber position and orientation fracture load of fiber-reinforced composite. Dent Mater 2004;20:947-55. 24. Freitas C, Miranda M, Andrade M, Vaz L. Resistance to maxillary premolar fractures after restoration of class II preparation with resin composite or ceromer. Quint Int 2002;33:589-94. 25. Belli S, Erdemir A, Ozcopur M, Eskitascioglu G. The effect of fibre insertion on fracture resistance of root filled molar teeth with MOD preparations restored with composite. Int Endod J 2005;38:73-80.